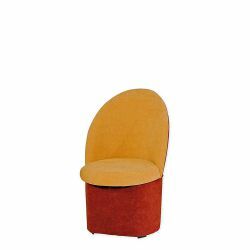 This collection contains practical and at the same time comfortable chairs, armchairs and poufs for the young user's room. Spending a lot of time at the table on a poorly adjusted chair or armchair can lead to back pain. Therefore, the ideal chair should be as comfortable as possible. Designers receive it through appropriate profiling and regulation. We must pay special attention to the backrest, which should reach at least the height of the shoulders of the young user, the corresponding armrests, as well as a special bulge in the lumbar region of the spine. The turning chairs, which are available in the Strade Furniture range, have been designed to give the youngest maximum comfort. We have prepared products that have a unique appearance, design and high-quality materials of which they were made. Thanks to such chairs and armchairs, sitting in front of the computer, for example, will not only be comfortable, but also healthy. All our models of armchairs and poufs were designed and manufactured taking into account the principles of ergonomics, which means that a young man can successfully use them for hours. Some of the turning seats from our Strade Furniture range are also equipped with self-locking wheels, which greatly improves the safety of children and adolescents. We offer a wide range of products, where even the most demanding customers will find something for themselves. In our offer there are children's puffs, in which there are interesting, fabulous fairy tale upholstery motifs designed for both girls and boys. We also have single-color puffs that can easily be adapted to other furniture in the room. For teens we also recommend elegant and comfortable office chairs made of genuine leather. Strade Furniture also offers other necessary furniture for children and teenagers. For example, a youth table that, together with a turning chair, will create an ideal set where the homework will be pleasant, and the level of development of our children will grow.